We're Officially BloggerVenturers at "DETOUR: The Island Cove Adventure"
I am excited! Why? Well, because me and my wife are officially "BloggerVenturers"! 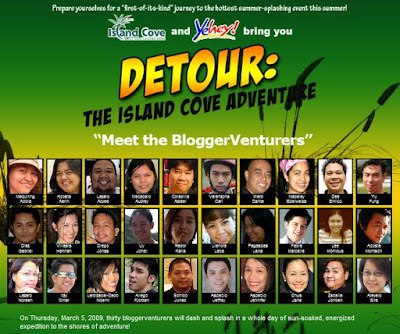 On March 5, 2009, I, Jennie and 28 other BloggerVenturers will be spending a whole day at Island Cove for "DETOUR: The Island Cove Adventure". This event is sponsored by none other than Island Cove and Yehey and we're really excited that we are part of it. What makes it more exciting is we will be meeting the other BloggerVenturers who we bump to online. In addition to that, exciting prizes will be given away to participants who complete special tasks. I have blocked the whole day for this event and we are looking forward to being out in the sun early this year. So, fellow BloggerVenturers, see you next week!